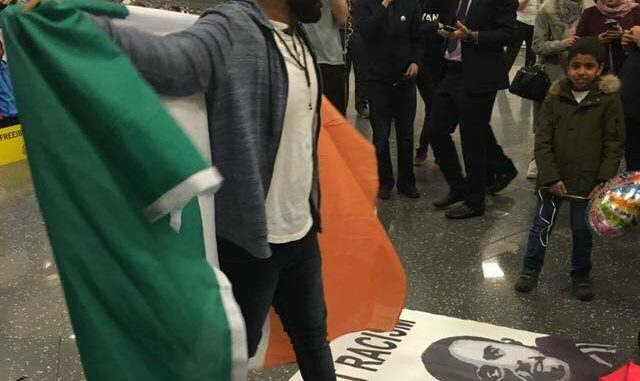 There was a big crowd at the airport, including family members, friends, individuals and activists from various solidarity groups and organisations such as Amnesty, Uplift, IPSC, United Against Racism, to name a few. Representatives of political parties were also present including Lynn Boylan MEP SF, Gino Kenny TD PBP, Katherine Zapone TD and various Cllrs. Throughout the morning there were many social media messages in support and solidarity with Ibrahim and his family. It was a joyful morning but many people were asking why it had taken so long for the government to act and how the Egyptians could justify keeping him in prison for 4 years. Maybe there are still questions to be asked. But today was a day of joy, solidarity and anti-racism. 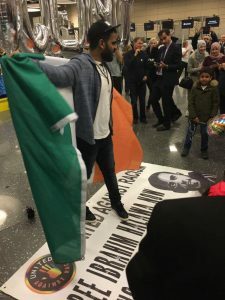 The huge media attendance was a clear sign that long and persistent campaigning had brought this issue to the forefront and after a long period of ignoring it the Irish government had to finally listen to the calls to fee Ibrahim. This, in our view was one of the key reasons why he had to spend four years in prison. 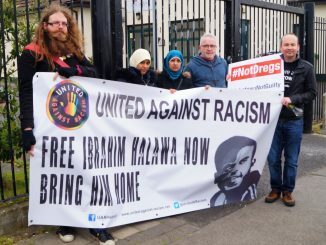 We, in United Against Racism (UAR) are proud to have stood in solidarity with Ibrahim and his family. We are also proud to have contributed to the wider campaign in solidarity and unity. Only a few months ago things weren’t looking good when we had a big rally in front of the Dáil and Ibrahim’s letter was read out. We congratulate the Halawa family for their tireless campaigning and always staying hopeful throughout. What was done to Ibrahim was a gross injustice. It was also an attack on democratic right to protest. We reject this injustice and attack on civil-human rights. We also reject shameful racist commentary circulated against Ibrahim and the campaigners. We welcome Ibrahim to his home, Ireland. We hope he can now leave all the horrors behind and start a new phase in his life in Ireland. Solidarity from all of us in United Against Racism.